Daryl Johnson (Worcester Park, United Kingdom) on 9 March 2013 in Lifestyle & Culture and Portfolio. 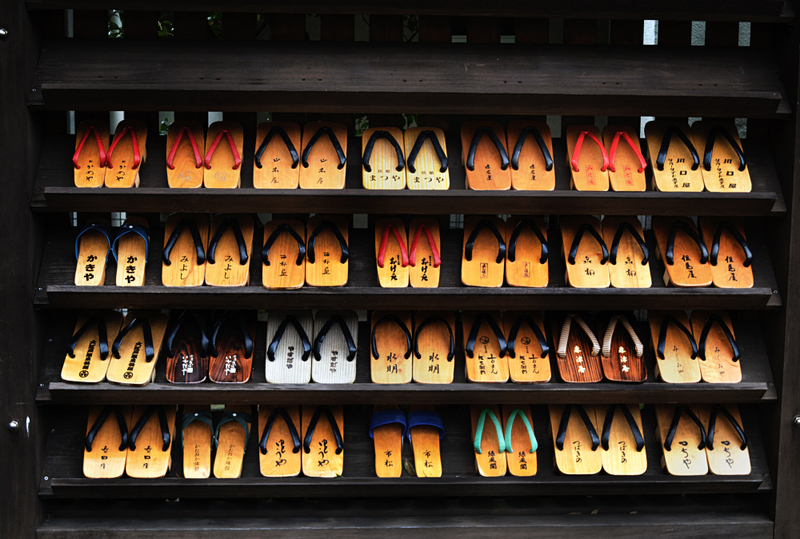 Typically in an onsen town, if you leave your ryokan (inn) and go for a walk around town, you take a pair of these slippers (geta) which will be available at the ryokan entrance. If you visit a public bath, you take off your geta and put them in a getabako (shoe cupboard / shelves) like this one. When you leave the bath house, you have to make sure you take the geta bearing the name of your ryokan (you can see the names written on the slippers) - even if its not the pair you arrived with, the right geta are eventually returned to the right ryokan. This is the final shot from Kinosaki Onsen; a new destination from tomorrow! Wonderful graphism and excellent exposure ! Highly graphic and colorful. Clever idea. A cool shot and interesting information. A very inspired image, Daryl, with high graphic quality! Nice shot for a great series. Wonderful trip!